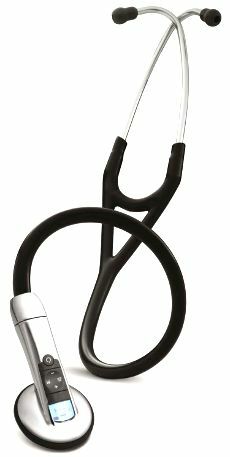 This stethoscope delivers exceptional sound quality and a simple-to-operate user interface. Clinical evidence shows that it’s easier to detect difficult-to-hear heart sounds, like S3 gallops, aortic regurgitation murmurs and abnormal lung sounds. With these sound and usability improvements, you might never go back to your old stethoscope. State-of-the-Art Sound Sensor. Providing a life-like sound experience equivalent to a high-end cardiology stethoscope. Frictional Noise Reduction Technology. Designed to reduce distraction from handling noises. Up to 24X Sound Amplification. Helpful for faint heart, lung or body sound, obese patients or when a patient’s clothing restricts your listening experience. Proprietary Ambient Noise Reduction Technology. Reducing on average, 85% of interfering background noise. On-board recording and playback capabilities. Helpful when seeking a peer opinion or when you are writing up notes on your patient’s condition, after your patinet has left. Bluetooth® technology. Lets you transmit sounds real-time to your PC, which can then be further analysed or attached to medical records. Free heart and lung sound visualisation software. Helps you detect and classify suspected heart murmurs whilst with your patient.